The flu? A nasty cold? All the illnesses running rampant out there? But I know, brighter days are ahead! Hope you get well soon! 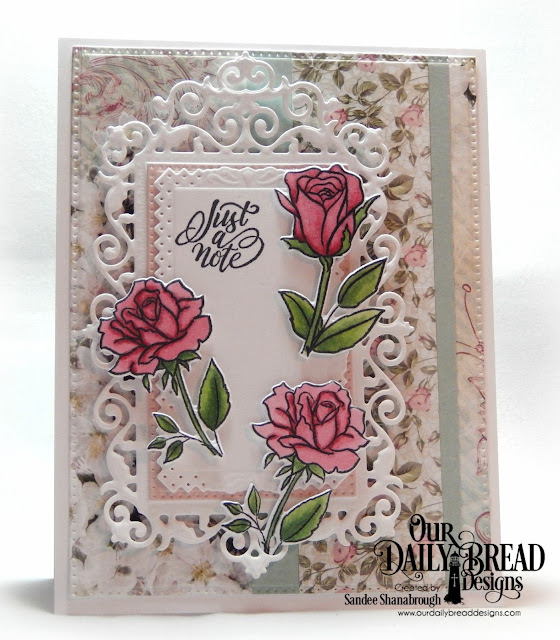 This card features one of the new floral Stamp/Die Duos that were released at the first of January. It is called Hello Friend. I colored the beautiful peonies and cut them out with the coordinating dies. 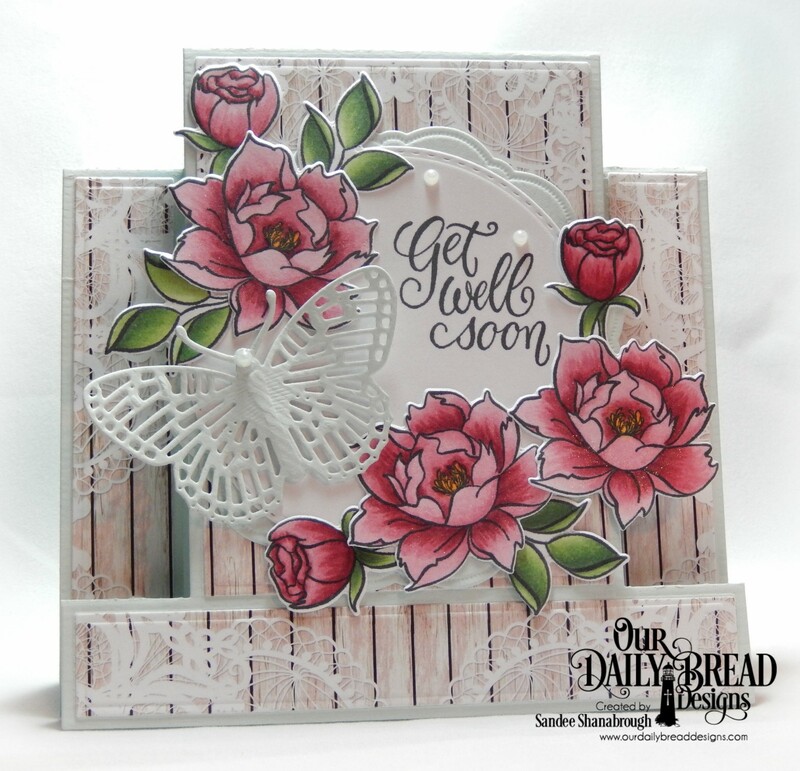 I stamped the sentiment onto an Ornate Oval which is glued onto the Lattice Background attached to the piece of designer paper from the Shabby Pastels Paper Pad. Then I arranged all the pretty peonies around the sentiment. Finally I added a few pink rhinestones and clear wink of stella to the flowers and leaves. The card base was cut with the Center Step Card die and then the layers were cut with the Center Step Card Layers dies. I used Layered Lacey Ovals and Oval Stitched Rows for the center panel. 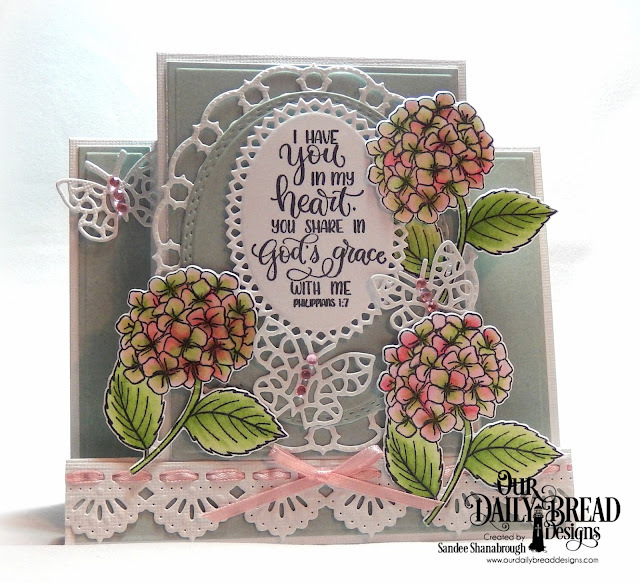 The gorgeous hydrangea blooms and the sentiment are from the new Stamp/Die Duo called In My Heart. The blue designer paper is part of the Romantic Roses Collection. I have also used Beautiful Borders and Bitty Butterflies along with tiny pink rhinestones and pink ribbon. Today we are looking back at the ODBD January Release! I have two cards I am sharing today! My first card is done with the Center Step Card die and Center Step Layers dies and features the new Stamp/Die Duo called Hello Friend! I colored the glorious peonies with copics and cut them out with their coordinating dies. The designer paper is part of the new Romantic Roses Paper Collection. I also used Double Stitched Circles, Doily and the Fancy Fritillary dies. A few pearls complete this card. This one features the Stamp/Die Duo called His Love Endures. I used the Romantic Roses Paper Collection, along with the following dies: Large Numbers, Oval Stitched Rows, Beautiful Borders, Doily, Rectangles, and Ornate Ovals. For more inspiration with the January Release, check out this LINK. Hello there! Hope you are having a great week! Here is one for the Color Challenge at Split Coast this week. These are not the exact colors listed but thank goodness they are only a guideline since I don't own those colors and these colors are fairly close! I colored the happy little daisy from the ODBD Stamp/Die Duo set called Call to Me with copics and cut it out with the coordinating die. The pretty solid pastel green paper is from the new Romantic Roses Paper Collection and is cut with the Center Step A2 Layers and the base card is cut with the Center Step A2 Card die. I also used Fence, Bitty Borders, Leaves and Branches, Oval Stitched Rows, and Vintage Borders. I added some pearls and pretty seam binding to complete the card. Today I have a card for the Sketch Challenge over at Splitcoast! And I have to say, these little roses are so fun to color! They are in the new ODBD Stamp/Die Duo called His Love Endures. They are colored with copics to match the gorgeous new Romantic Roses Paper Collection. I also used Pierced Rectangles and Filigree Frames. Hope you are doing great this first week of 2018! I have a card to share featuring pretty new daisies from Our Daily Bread Designs! I used today's Sketch Challenge #678 at Split Coast for my design for this card. This new stamp set is a Stamp/Die Duo and is called Call to Me. I colored the daisies to match the new Romantic Roses designer paper pack (although it is hard to tell in the photo) and cut them out with the coordinating die. The daisies are popped up over a strip of the paper which is over another panel cut with the Daisy Chain Background die with the Deco Border across the bottom. A sweet and simple CAS card! Welcome to the ODBD January 2018 New Release Blog Hop! 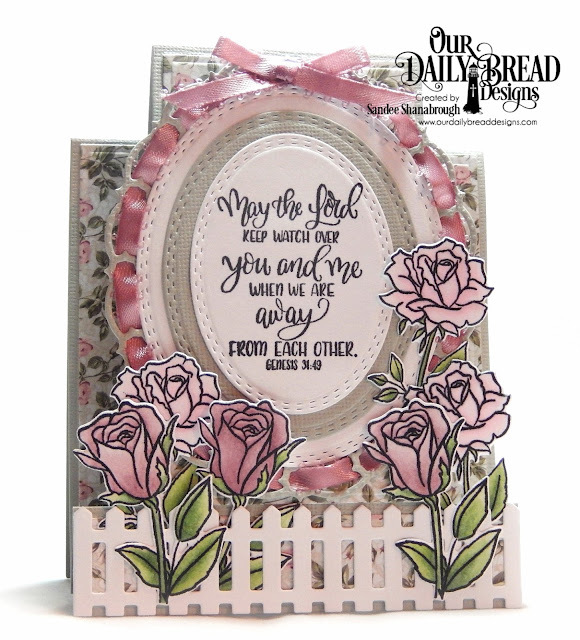 January 2018 New Releases from Our Daily Bread Designs! The beautiful sets this month were designed by our very own Diana Nguyen! Before we get started, let's get the particulars out of the way. We are changing things up a bit as blog traffic patterns have changed dramatically in recent years. Beginning this month, all giveaways will be done through Social Media, so be sure to follow ODBD on Facebook and Instagram! You can find all of the information at the Our Daily Bread Designs Blog. I did a Center Step Card using the new Center Step A2 Card Die and the Center Step Card A2 Layers. 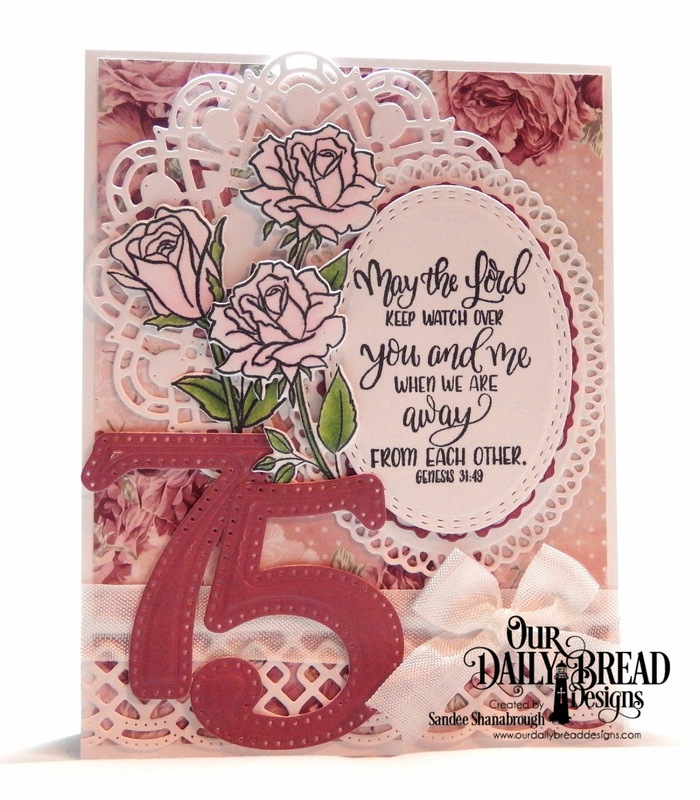 The gorgeous roses and the scripture are part of the new Stamp/Die Duo called His Love Endures, colored with copics and cut out with the matching dies. The gorgeous papers are from the new Romantic Roses Collection. I used Oval Stitched Rows for the scripture focal point with a mat made with the largest of the Layered Lacey Ovals dies. I threaded matching ribbon through the oval and added the little bow on top. The roses are tucked here and there and through the Fence on the front panel. This one is very CAS! 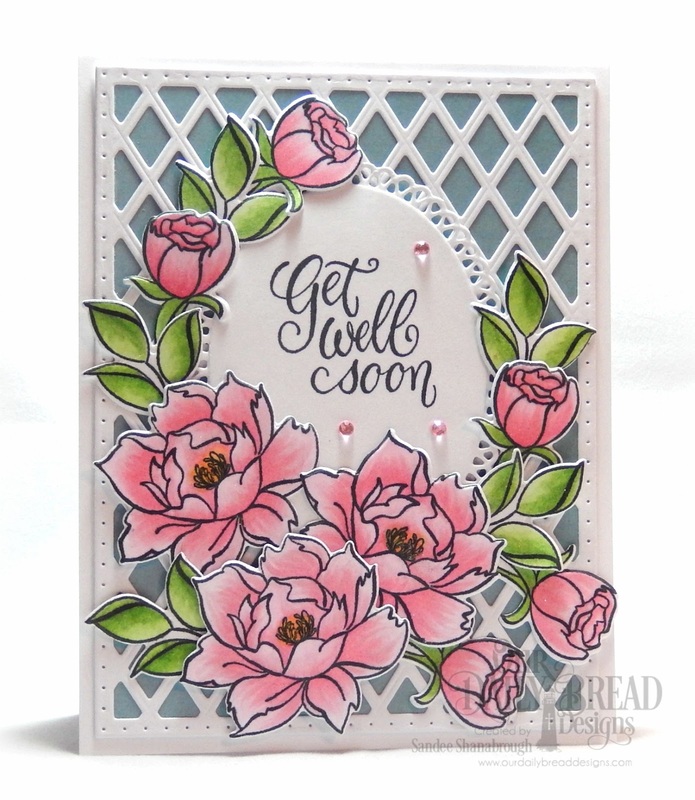 The sweet little hydrangea from the new Stamp/Die Duo called In My Heart is colored with copics and cut out with the matching die. I made a little frame with an Oval Stitched Rows die (the stitched part doesn't show), the largest Snowflake Sky die, and a Layered Lacey Oval die. I tucked in a pretty solid colored pieces of the new Romantic Roses Paper behind the hydrangea. Sweet and simple friendship card! ODBD Facebook and Instagram pages for the giveaways! Thank you for all of your sweet comments and encouragement this last year! I hope you all have a blessed 2018!